AAS established the Program in the History of the Book in American Culture (PHBAC) in 1983 in order to focus its resources on promoting an emerging field of interdisciplinary inquiry. Through the Program, AAS draws not only on its traditional resources as a center of bibliographical research and as a matchless repository of early American printed materials, but also on recent intellectual currents that look at the history of books and other printed objects in their full economic, social, and cultural context. A significant goal of the Program is the publication of a five-volume, collaborative scholarly work, A History of the Book in America, which treats the subject from the early seventeenth century to our own times. An Editorial Board of distinguished scholars, chaired by David D. Hall, oversaw the series, which was published by AAS and University of North Carolina Press. 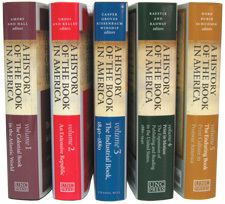 Volume 1, The Colonial Book in the Atlantic World, edited by Hugh Amory and David D. Hall, was published in 2000, and reissued in April 2007. Volume 2, An Extensive Republic: Print, Culture, and Society in the New Nation, 1790-1840, edited by Mary Kelley and Robert A. Gross, was published in July 2010. Volume 3, The Industrial Book, 1840-1880, edited by Scott E. Casper, Jeffrey D. Groves, Stepher W. Nissenbaum, and Michael Winship, was published in August 2007. Volume 4, Print in Motion: The Expansion of Publishing and Reading in the United States, 1880-1940, edited by Carl F. Kaestle and Janice A. Radway, was published in January 2009. Volume 5, The Enduring Book: Print Culture in Postwar America, edited by Joan Shelley Rubin, David Paul Nord and Michael Schudson, was published in September 2009. Substantial funding from the National Endowment for the Humanities provided major support for the editorial work that inaugurated this important project. In providing intellectual leadership of this field, the Program has sponsored conferences, publications, seminars, and research fellowships. A summer seminar in the history of the book, offering short-term, intensive training in methodologies and concepts, was initiated in 1985. These annual seminars have been successful in assembling a stimulating range of persons as both faculty and matriculants and putting them in touch with AAS library collections and, just as importantly, with each other. The seminars have in fact helped recruit a generation of scholars into the book history field. A conference that included European scholars was held in 1984, and resulted in the publication of Needs and Opportunities in the History of the Book: America, 1639-1876. An earlier conference in 1980 resulted in the publication of Printing and Society in Early America, a collection of original essays, some of which have since become widely cited. More recent conferences have focused on teaching the history of the book and on the iconography of the book. The annual series of James Russell Wiggins Lectures in the History of the Book in American Culture, inaugurated in 1983, has brought forth important conceptual statements by leading scholars in different disciplines touching on the field. The lectureship honors James Russell Wiggins, former editor of the Washington Post, former United States ambassador to the United Nations, and editor of the Ellsworth (Maine) American until his death on November 19, 2000, at the age of 96.